Less than three months after entering Open Beta, Hand of the Gods is live on Steam’s Early Access program! Players will have the opportunity to discover, download, and play Hand of the Gods for free through Steam’s platform starting now. This announcement comes shortly after a major content patch filled with new systems and features requested by the community. From Clans, to Deck Tracker, and an updated combat log, the team put emphasis on features that would give new players the best in-game and out-of-game experience possible. The arrival of Hand of the Gods on Steam also introduces the new Starter Pack which contains a collection of 7 core packs and a skin for Ra, leader of the Egyptian pantheon. Additional card packs can also be earned through gameplay, and each pantheon offers a unique strategy for players to experience. The Founder’s Pack will also be on sale for 25% off during our Steam Launch! Players will be able to jump start their collection of cards with the Legendary Gods Enyo, Poseidon, Freya, and Isis, along with 75 more cards from core packs! New cards and ongoing balance adjustments are no stranger to Hand of the Gods, and you can expect the games 7th pantheon in the near future. Led by Ganesha, the Hindu pantheon is coming soon, and will feature new Gods, creature, and spell cards, making this a perfect time for new players to check out Hand of the Gods. 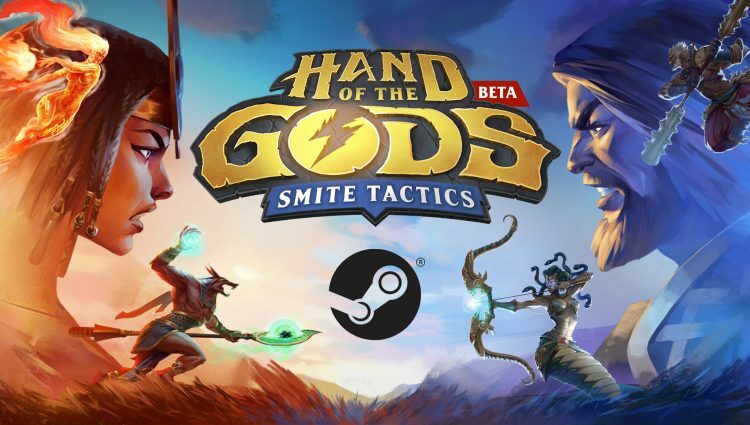 Visit http://store.steampowered.com/app/648430 to download and play Hand of the Gods for free on Steam today, and for the latest information on Hand of the Gods follow our Twitter @PlayHotG.